Backers of SoccertCity claimed Friday that attendance at San Diego State University football games cannot support a $250 million stadium envisioned by the competing SDSU West plan. The Aztecs for SoccerCity student coalition said data from a public records request showed game attendance well below the 35,000-capacity planned by the university. Despite the football team’s winning 6-2 season last year, turnstile attendance at SDSU’s most recent home game, the homecoming game against San Jose State on Oct. 20, was just 18,858 — a 34 percent drop compared with last year’s homecoming game. Overall attendance this season is down 31 percent from last year, according to the coalition. SDSU is currently paying $1 million a year to lease SDCCU Stadium, which costs $7 million a year to operate, according to City Councilmember Scott Sherman. 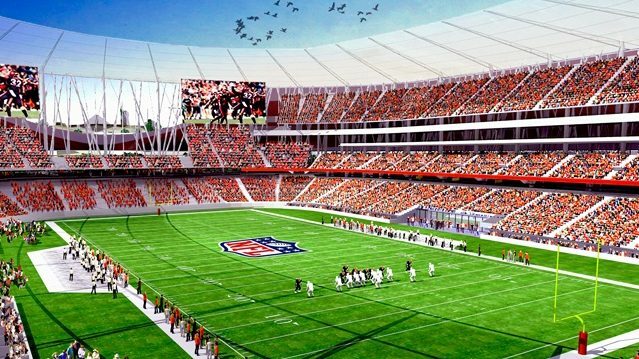 “If they’re asking city taxpayers to pay a $6 million annual subsidy for the team now, I can’t imagine how they’ll foot the bill for a brand new stadium with nearly twice the number of seats as their average attendance in the midst of a winning season,” said Sherman, who represents the district that includes both SDSU and the Mission Valley stadium. Competing plans, Measures E and G, are on Tuesday’s midterm election ballot. Measure E calls for private development of a 23,500-foot soccer stadium that could also accommodate Aztecs football, a river park, commercial and residential areas, and space for a campus extension. The university would guide development under Measure G, with plans calling for the 35,000-seat stadium, commercial and residential space, a river park and a campus extension.